In just six holes, Mickelson went from a a six-shot deficit to a two-shot lead beating Tiger Woods by 11 shots in a stunning victory putting Tiger Woods dreams to an end. 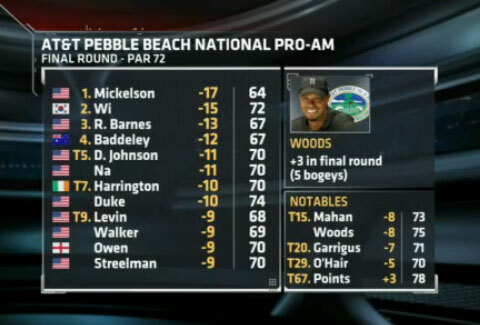 “Pebble Beach – it feels awesome no matter what number it is,” Mickelson said. Mickelson will now move to No. 11 in the world finishing at 17-under 269 and earned $1.152 million for his first win since the Houston Open last year. PFP Sports and Celebrity Talent Agency is a speakers bureau and top booking agent for sports speakers, golf speakers, athlete appearances and endorsement deals. We assist corporations in booking golf pros and sports stars for athlete appearances and corporate events. Phil Mickelson is also a popular cancer speaker. Phil’s wife Amy was diagnosed with breast cancer in May 2010 and has undergone successful treatment. For Phil Mickelson speaker and Phil Mickelson booking agent information, call 1.800.966.1380.